What is an Impact Extrusion Heat Sink Design? An impact extrusion heat sink is a heat sink created using the impact extrusion process. This process forces the aluminum through the holes in a special open tooling die through a sudden, single strike or “punch.” This allows the creation of thin-sectioned, high precision heat sinks with high aspect ratios. This process also has the ability to accommodate fin thicknesses as thin as 0.020” and fin heights over 1” tall for the same base. 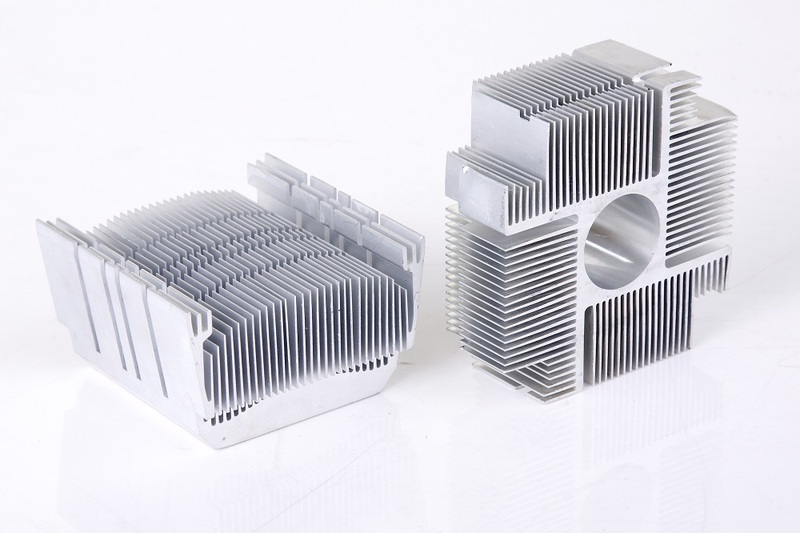 The impact extrusion process—otherwise known as precision forging–for the production of heat sinks has several advantages over some of the more traditional production methods such as casting and machining. Using impact extrusion to produce aluminum heatsinks can reduce the amount of secondary operations such as machining, which saves both time and money. Another benefit to the impact extrusion process is that it reduces the amount of waste material created by the process. As noted before, the biggest benefit to this process is the ability to create aluminum shapes that simply cannot be replicated using other production processes. Because they can be produced with little rework or machining, the production cycle is much shorter, allowing you to reduce the amount of time to deliver finished heat sinks to your customers. Impact extrusion heat sinks are used in industries that require thermal management solutions that need to dissipate heat efficiently such as the lighting industry for LED thermal management and heat dissipation in electronic devices. The products in both of these industries tend to generate a lot of heat that needs to be successfully managed without adding a lot of weight to the item and extruded aluminum heatsinks with high aspect ratios are essential to taking on this task. The combination of our state-of-the-art impact extrusion press, premium aluminum billet, and years of heat sink design knowledge will provide you some of the best thermal management solutions available on the market today. Give us a call at 888-000-8499, contact us online, call us at send us an email at sales@getecna.com to speak to an impact extrusion heat sink design expert today.